Keep getting an established "root" (not my user name) with password request that always fails. Seems like driver was installed. Just can't get through this final set up step. Did you follow these steps to install the printer ? Had no issues with stable Scorpion. Was in midst of going back to it, but curious as i am... will maybe try Centaurus again to see if p.w. change will work. Also recall an error message in terminal when trying to download the plugin, but can't find the piece of paper i jotted it on. Did passwd change as recommended and plugin still won't install. Also did hp-plugin as per screenshot. 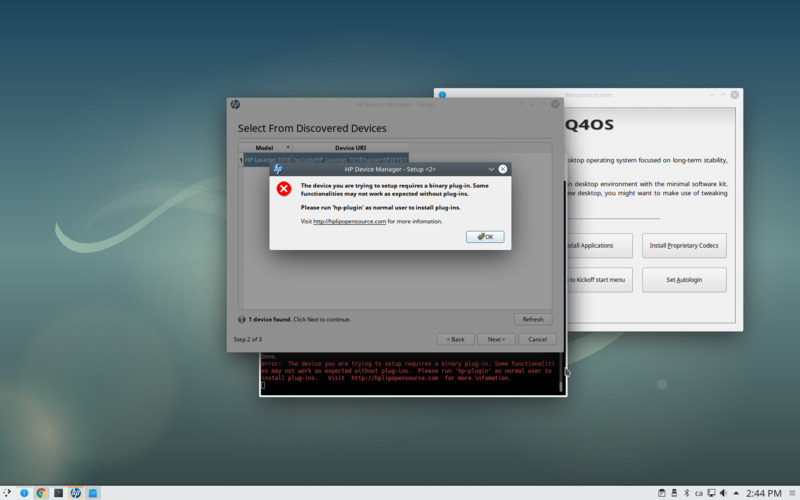 when opening HP Toolbox to install the printer, it sends back to install plugin again with error message "unable to receive key form key server..." (shrug). Back to Scorpion now and HP printer setup (as per Q4OS docs) and printed test page like a breeze! There are broken dependencies in Centaurus at the moment, it should be solved soon, please try it in a few days again and report back. Will be on the lookout! Broken dependencies in Q4OS Centaurus testing version are fixed now, you can install all the needed and eventually report back. Updated Centaurus installation media will be available for download in a few days. Think i'll have to wait for the installation media to start fresh. Upgrade seems to have gone well but even after full profile upgrade, there is only option to log into Trinity (at boot). Found the little drop-down to install KDE Plasma. had to do hp-plugin instead of sudo hp-plugin. -also asked for password (which i then dutifully changed per your post in this thread = sudo passwd). HP toolbox still wants to download plugin (even if successfully installed as per my previous post). Went through CUPS setup (1st time ever) and was lost. Didn't know which printer option to install. Anyway, chose one and after a few this and that, for some reason, printer was finally installed and test page printed!!!! Never seen such a complicated thing. Btw, this HP LaserJet 1018 has been a hassle for other distros (like Manjaro and to a lesser extent, Solus). HP OfficeJet with fax (via ethernet as opposed to usb for previous LaserJet 1018) installed on first try. HP toolbox requested plugin to be installed (again!). Have now gone back to Scorpion. Plugin (although "unable to receive key from key server do you still want to install" message popped up) and test page went well on first try.